New Home on large home-site under construction. Gorgeous 2 story with open floorplan and 3 car garage! Backs to Meadowlark Park in the Rockwood School District. 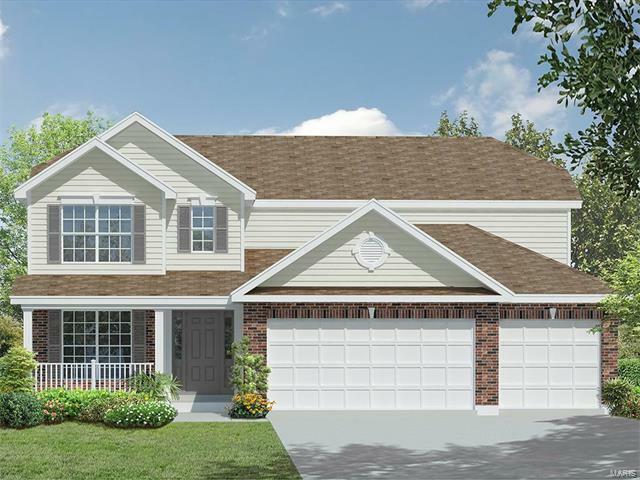 This Nottingham model features a 3 car garage, 9’ 1st floor ceilings, flex room/office off of foyer, Breakfast Rm bay window, 6' windows on 1st floor. The kitchen has a walk-in pantry, 42” wall cabinets, stainless steel appliances & granite countertops. G.R. features a gas Frpl & open stairwell to the 2nd floor & Lower Level. A large master suite features a large walk-in closet & luxury master bath with separate tub & shower and adult height vanity. Zoned heating & cooling, 6 panel doors and 15 x 15 concrete patio. Photo images are of former Nottingham Model. Optional or different features may be shown. Consult with on-site sales for a list of included features. At the corner of Maple Lane and Hutchinson Road. I-40 to South on Clarkson Road, right on Manchester Road, right on Hutchinson Road to left on Virginia.